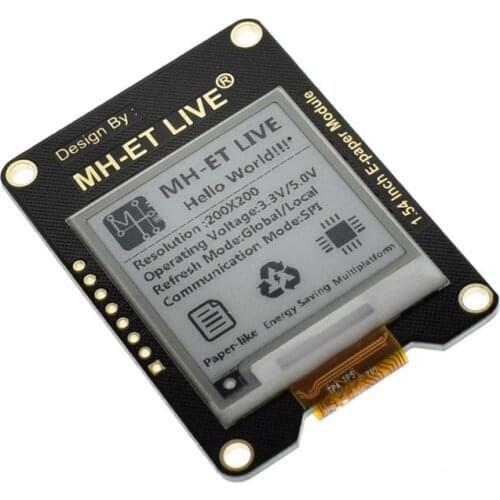 I started out with an lifesaving library for e-paper by @MichaelPralow, thank you very much for your work. Module usage described here. Make sure the Interface switch on the back side of the module is set to «L». After that i started digging info about LUT data, Addresses of X and Y start and end, and that was a pain. Maybe i missed something, but i spent hours trying to implement data i found in a specification doc for GDEP015OC1. lutRegisterData is used once in an init method of the module and also i don't need to update screen fully, so i'll just leave it here in case someone needs it. And one more: i saw definition of a preset for GDE021A1 model in module's code and wanted to ask if it is possible to update the SSD1606 module's code with the preset for GDEP015OC1 to make it more flexible? If so, what am i required to do for that? Thank you. I was so excited with the final success i forgot about everything i studied about writing and submitting changes community rules) When i have time to do it the most proper way i will surely make a merge request. And could you please provide some reference on those bot modules? I'm afraid i've never came across any. @Zak, are you talking about 'as hardware' or 'used in hardware'? Espruino software modules are sometimes called after the controller in the hardware module or device - for the case at hand, any display that has a built-in controller of such can be run with the same Espruino software module. Ahh. bot -> both? I was a bit confused too. So you just create your own fork of EspruinoDocs on GitHub, edit the files, and submit a pull request. You can pretty much do it all online as well, but if you have issues just post your version of the file here and I'll update it manually. @Gordon, thank you! I'm familiar to git so i think i'll be capable to do a fork and a merge request. Sorry for being that slow — i hope everything would be done by this weekend. Am i not supposed to do the minified version?